Were you there? If not, you missed an informative and lively event! 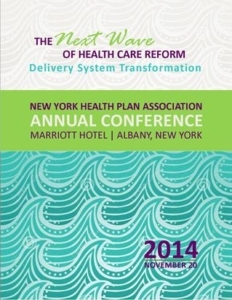 More than 200 people attended HPA’s 2014 Annual Conference on November 20th—an informative one day event looking at ongoing efforts to reshape the health care delivery in New York and across the nation. NCQA’s Margaret O’Kane, who kicked off the day, told people that “collaboration is critical” for system reform. Courtney Burke, Governor Cuomo’s Deputy Secretary for Health, noted “we’re all accountable” when it comes to improving outcomes. A panel of antitrust experts looked at the issue of collaboration without crossing the antitrust line. NY State of Health Executive Director Donna Frescatore highlighted changes to New York’s marketplace, including easier shopping and new tools to help consumers compare plan options. Thanks to all who made the day a success. Hope to see everyone at the 2015 Annual Conference! Margaret E. O’Kane is President of the National Committee for Quality Assurance (NCQA), an independent, non-profit organization that improves health care quality through measurement, transparency and accountability. Ms. O’Kane has served as co-chair of the National Priorities Partnership and is a board member of the Foundation for Informed Decision Making and the American Board of Medical Specialties. She was elected a member of the Institute of Medicine in 1999 and received the 2009 Picker Institute Individual Award for Excellence in the Advancement of Patient-Centered Care. She received the Gail L. Warden Leadership Excellence Award from the National Center for Healthcare Leadership in 2012. Modern Healthcare has named O’Kane one of the Top 25 Women in Healthcare three times, most recently in 2013. A master’s degree holder in health administration and planning from Johns Hopkins University, Ms. O’Kane is a recipient of that university’s Distinguished Alumnus Award.